Solo Build It! - aka SBI! - is to an e-business Solopreneur as a Meccano Set is to a budding Engineer. Both teach sound principles and allow wide latitude for a competent practitioner to use their initiative when in the creative mode. Which, by the way, should be always!! Nevertheless, as is common in Human Affairs, things are not always what they seem. E-commerce suffers from an easily rectified fallacy. A misconception has grown in Internet Marketing circles that a website is a web business. It is well to deal with this misconception early. It is fine to have a website, but a website is not a web business. As much fun as it is constructing a high tech Site, it accounts for a piddling 10% of constructing a Business. To construct a web business, one needs a website and a business mindset, capable of applying sound business principles. In the same manner as a budding engineer needs to understand the Laws of Physics to invent and build in the material world. With today's technology, putting up a website is not difficult. Transforming your website into a business is a little, well actually a lot, more involved . . . This is where SiteSell and Solo Build It! excel. Business building is their specialty. Notwithstanding the Ancient Greek Golden Ratio, which indicates we all share a common appreciation of proportion, there can be no doubt, beauty is in the eye of the beholder. This holds true for everything we Humans encounter, including Websites. The “look and feel” of a website is important and SiteSell offers plenty of choice and options in website design. Good looks with the emphasis on functionality. SBI! is first and foremost a business building platform. In other words, while it provides for an awesome look and feel – depending on your predilections - it’s primary focus is to provide the Tools and indispensable Know How, requisite to building a rewarding business. Solo Build It! does this in a - to date - unmatched manner. 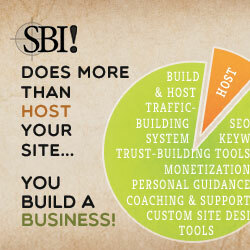 Offering a fabulous selection of templates and tools, both state of the art, SBI! enables you to create a top notch site of your choosing. Including fully responsive layouts that automatically adapt to whatever screen size they are displayed on. Incidentally, this is the Search Engines preferred layout. This site, Personal-Development-Rocks.com is such a layout. Have a play and change the size of the window you are in and watch it immediately conform. This is just one practical measure designed to improve visitor experience, and is the reason I use it. Many bells and whistles are available within this otherwise pragmatic business builder. Personally I don’t use them because my predilections - as do my theme site contents – lean towards the practical dimension of life. SBI! enables you to construct a cool website, including, if you wish, uploading your own HTML and CSS. Solo build It! places emphasis on guiding you through the truly important stuff in business building . . .
Executing this truly important stuff with the above mentioned business mindset will equip you with a practical understanding of what it means to be self reliant. Yet another of SBI!’s many strengths, and emphasizes it's sheer value. Spiritual and material. Principles And Know How Rock!